My role: Lead designer Social Design at ThinkPlace. Impact: Informed the strategic planning process for 2018 in order to shape the workplans for 2019-2025. What are Self-Help Groups in Singapore? Self-Help Groups are set up to uplift the less privileged and low income households in the Chinese, Eurasian, Muslim and Indian communities. All Singaporean Employees are required to contribute monthly to the SHG Funds. Contribution to the Self-Help group depends on the race and/or religion of the employee which is indicated on the National Registration Identity Card. One of the key Self-Help Group’s of Singapore wanted to clarify its strategic direction and priorities as it is currently ‘taking up all Malay/Muslim-related issues’. They recognise that the environment, both in Singapore and globally, is changing, and the community needs to keep pace to prepare itself for the future. 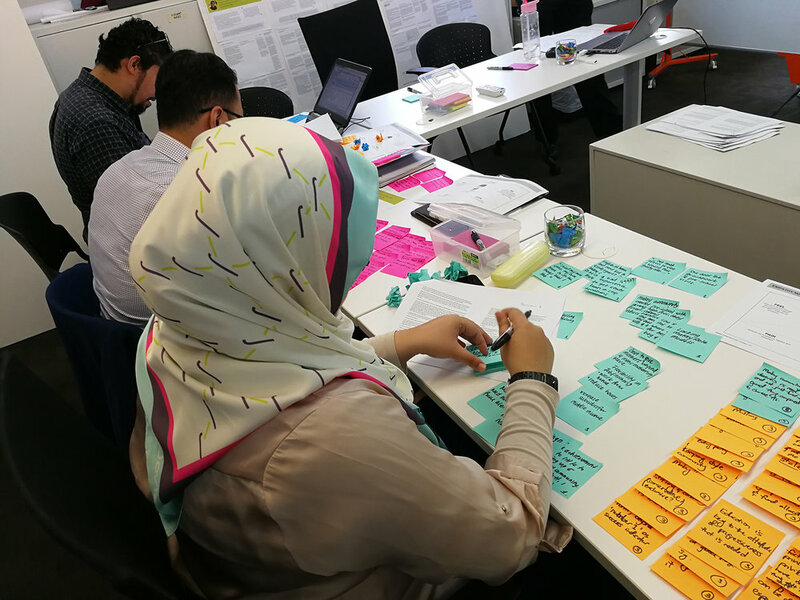 Design thinking is leveraged in this project to ensure the organisation’s place and value-add in the community. In particular, this project seeks to understand opportunities for the local SHG to remain relevant in the future, and to design and deliver programmes that support the strategic vision. 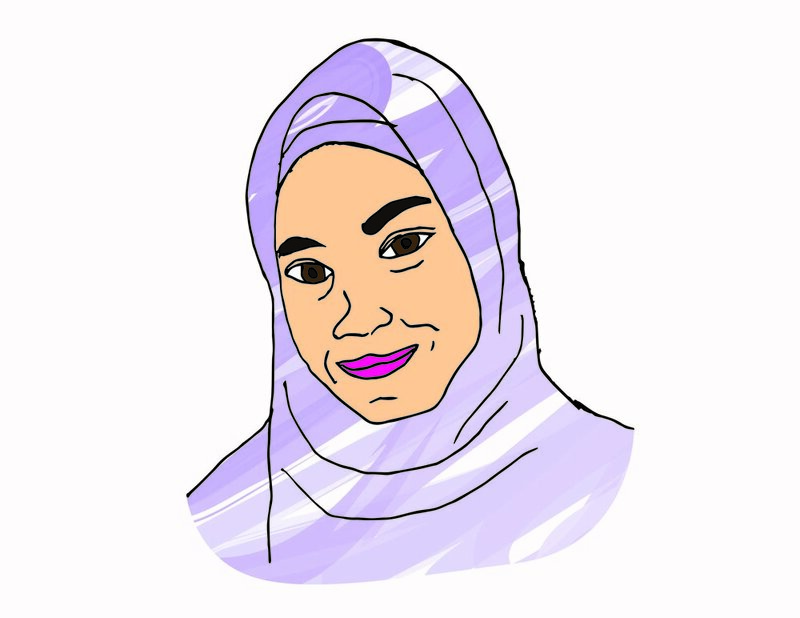 • To explore the real needs of different Malay/Muslim community profiles in Singapore to help deepen their understanding of the Malay/Muslim community. • To inform the strategic planning process for 2018 in order to shape the workplans for 2019-2025. • To design a blueprint and implementation plan for the local SHG programmes. 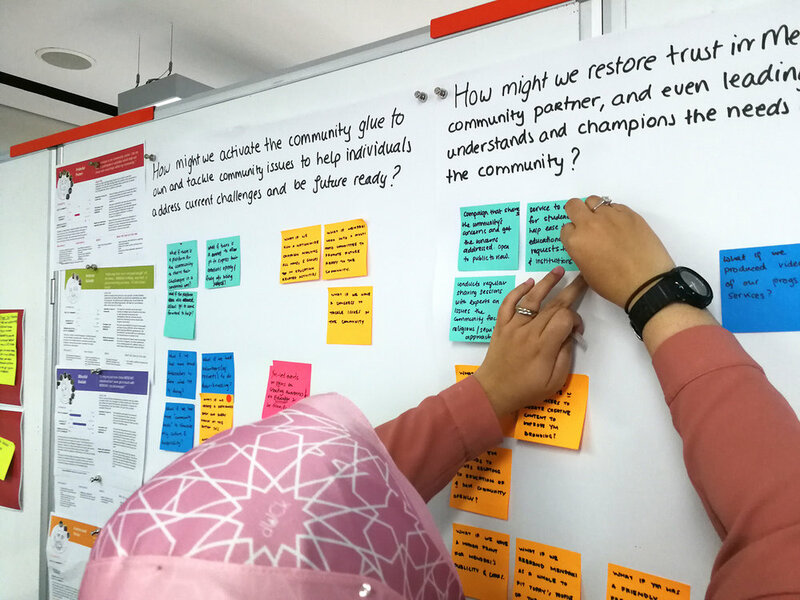 After setting the intent for the project and defining what success looks like with the exec team and senior management, ThinkPlace conducted broad ethnographic research to learn about the community’s aspirations, attitudes, hopes as well as needs, struggles and fears for the community. Furthermore, we explored the community’s perception and experience of the local SHG. We conducted 14 in-depth interviews plus 9 online interviews through photo journaling. We used several tools such as experience mapping and icon prompts to encourage participants to share stories and experiences. Combining these methods allowed us to go deep in the interviews and visual and broad through photo journaling. Our 23 participants represented a well-rounded mix of different income and education levels, in different life stages and with different levels of awareness of the local SHG’s services. 14 in-depth interviews were conducted to learn about the community’s aspirations, attitudes, hopes as well as needs, struggles and fears for the community. Tools such as experience mapping and icon prompts were used to encourage participants to share stories and experiences. We looked through the eyes of our participants and received visual answers on our questions regarding community. Through photo journaling we were able to reach more participants, enriched our research data and were able to ask questions hard to articulate in words. Research was synthesised together with the team of the SHG. Together with the team of the SHG, we co-created several strategic shifts and opportunity areas and ideated solutions together. Ideas were selected for prototyping to learn more. 7 Insights surfaced through all our community interactions and while many insights had been known to some extent by the local SHG, we discovered how national challenges and community frustrations lead into the lack of trust from the community in the local SHG. We then identified 3 main areas of opportunity along with 3 strategic shifts required. Through co-creation we came up with numerous ideas which we turned into 3 concepts which manifested the proposed shifts through service systems. Assumptions surrounding these concepts where tested through prototyping and iteration with the community. The prototypes were iterated based on feedback during the testing phase, and a final set was developed. These were documented in a blueprint, along with an implementation plan which would support a roll out of the final initiatives. 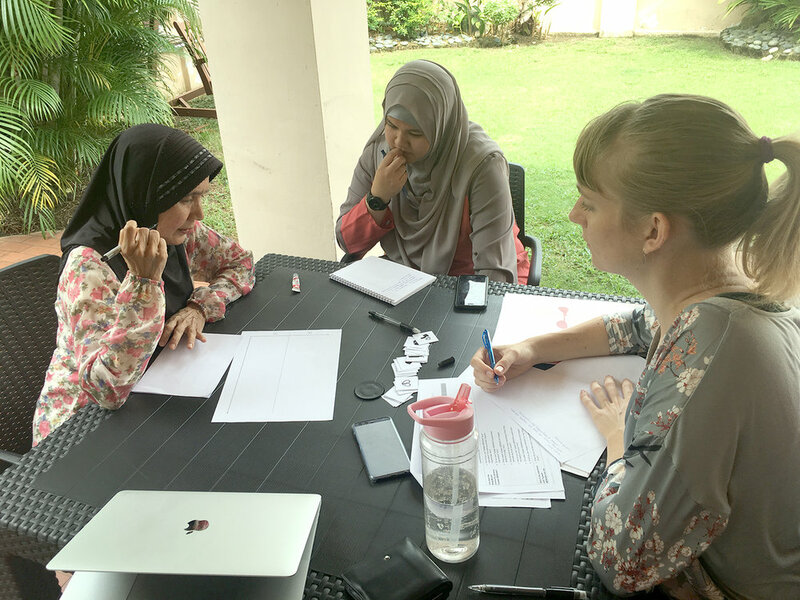 The project served as an opportunity to generate conversations on the organisation’s continued relevance and future directions for the Malay- Muslim community, and exposed the local SHG’s employees to different methodologies, tools and mindsets to think and act differently. The iterated and tested concepts illustrate a way forward for the local SHG to remain relevant and can be used as input into the internal strategic planning exercise.